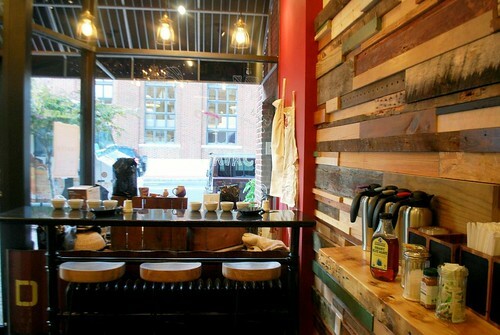 Attention Montclair coffee lovers– your mecca has arrived. 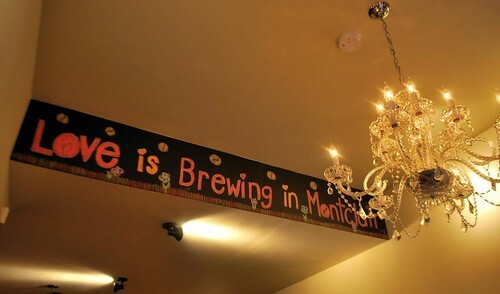 Though it’s only been officially open for two weeks, Java Love in Upper Montclair is quickly becoming the area’s go-to place for fairly traded, organic, and deliciously roasted coffee. 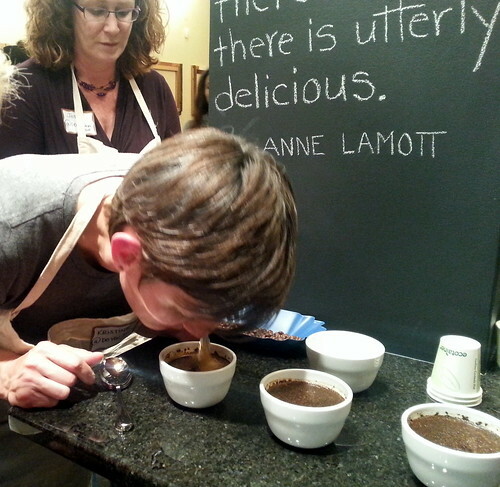 I got a first look at Java Love on a recent spring evening at their VIP tasting and “cupping” instruction. The owners, Jodie Dawson and Kristine Petrik, warmly welcomed the crowd and explained how their operation began after a move to upstate New York, where their neighbors’ recommendation for a great cup of coffee was actually Citgo (…the gas station). Kristine’s background as a trained sommelier proved to be an advantage as the pair took their new coffee roasting hobby and turned it into a career, with their first outpost opening in the Bethel, NY. After sampling their satisfying and potent cold brew iced coffee, as well as the dark and brooding Sumatran Aceh Gold blend, we were led into an informal but highly informative cupping session where we interacted with the pea berry, a hand-picked Kenyan coffee bean found in 5% of the beans, formed flawlessly from a genetic mutation. The cupping procedure involved first smelling the aromatic and oaky coffee as grounds, and then once again after boiling water was meticulously poured into it, giving it a different aroma as the flavors began to meld and brew. Then owner Kristine taught us the specific way to hold the spoon over the cup and quickly slurp the coffee, allowing you to experience the intensity and range of flavors, similar to a wine tasting. 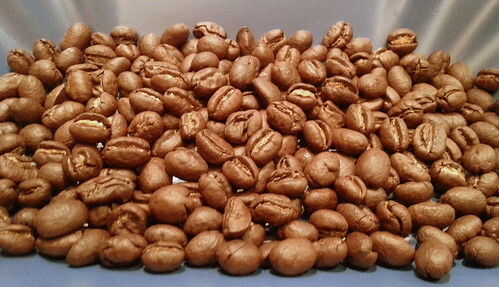 For this particular blend, Kristine explained how even a difference of three degrees can really allow the flavors to burst and alter the end result of the roast. The entire process allowed intriguing insight into the extensive work that goes into brewing the perfect cup of coffee. For anyone interested in learning more about this process, Java Love plans to offer on-site cupping classes in their future. 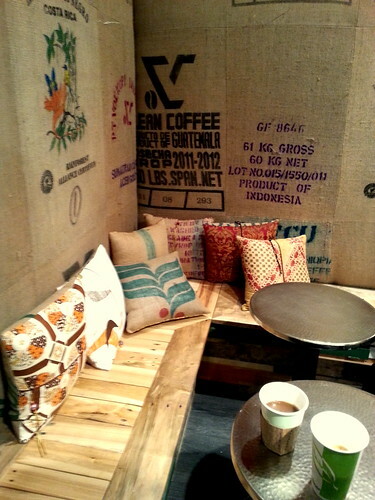 The coffee shop’s atmosphere is both welcoming and creative, with burlap coffee sacks doubling as fabric in the booths and on the pillows and artwork designed by Catskill artists. 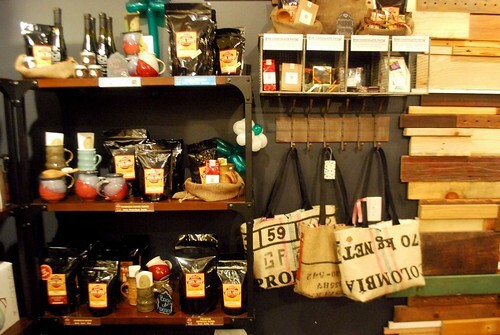 Goods line the shelves, including everything from five pound bags for those who need a bigger fix, to pouches and cup sleeves hand-made from coffee sack burlap. 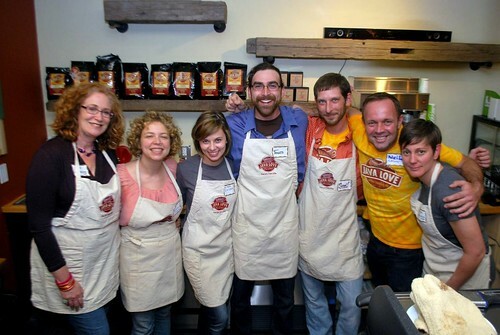 Java Love’s staff is a tight knit family who knows its beans and are ready to serve them up with a smile. Even the newest staff members are training to become master roasters and reading books on the coffee harvesting process. Java Love is a commuter’s dream, located near the Upper Montclair train station, right next to the Coldwell Banker and Bellevue Theater. Whether you’re looking for your new daily coffee fix or an occasional place to relax outdoors with an icy cup of cold brew, be sure to stop by Java Love and experience the earnest love these guys have for coffee. It’s contagious! Melissa Yurasits is the Jersey Bites Regional Editor for Jersey City. Melissa grew up on the Jersey Shore and returned to the Garden State after four years of living in Boston for college. Works in publicity/promotions by day but at night loves checking out new restaurants or cooking up new recipes with her boyfriend in their Jersey City apartment. Can’t name a favorite food, except for anything and everything cooked by her Dad, who doesn’t believe in recipes (but it turns out amazing everytime! ).